1080P@ 15 FPS, 720P @ 30 FPS & 960H @ 30 FPS Real Time Recording / Playback Quality. 1x HDD bay, support up to 4TB. 4x Audio-in / 1x Audio-out. Alarm Input x 4 / Output x 1. Firmware upgradable. Dual streaming technology to encode recording stream and network stream separately. Support DDNS and NAT function, QR code scanning by mobile devices. Aposonic AHD DVR supports streaming video on PC, Mac OSX, iPhone, iPad, Android phone and tablet. 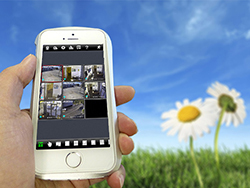 Users are able to monitor their most valuable assets anywhere around the world with their mobile devices over WiFi or 3G network.